Vintage From Paul is pleased to offer these Mayer China Co Restaurant Ware Peach Lotus Blossom Dinner Plates. As the name implies, the focal point of this pattern is a lovely peach lotus blossom on the rim of the plate. 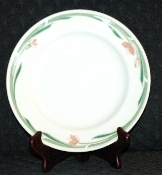 The Mayer China Restaurant Ware Peach Lotus Blossom Dinner Plates measure 9-5/8 inches in diameter. Each of the available Mayer China Restaurant Ware Peach Lotus Blossom Dinner Plates is in Mint condition with no chips, cracks or discoloration. The graphics are crisp, the colors vibrant. These Plates appear to be unused!